It's no secret Melbourne is King when it comes to coffee. Frothy capps, creamy lattes and nuclear-strength espressos are the basic legal ways to stimulate your Monday brain, but when the weather warms up, Melbourne gets partial to a cheeky cold drip. Some of these are your classic cold pour over ice. Others are a little...experimental. 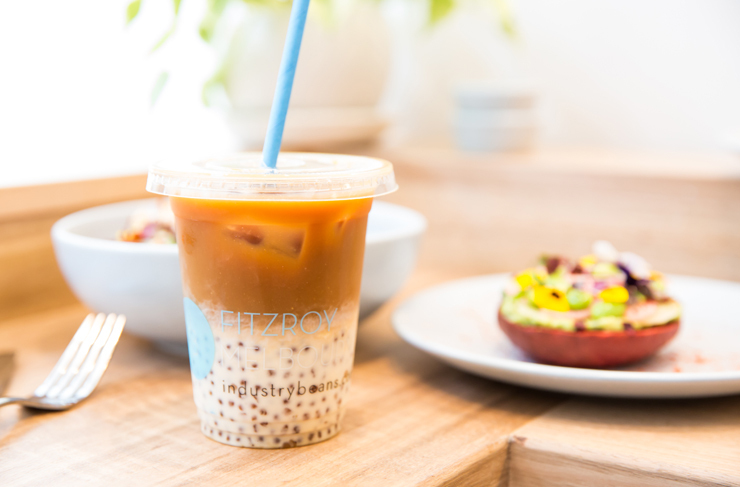 We've got cold drip bubble iced coffee, Vietnamese cold drip with condensed milk and something called a 'Cold Squeezed Nuts' (your guess is as good as ours). If it's coffee over ice, we've got it covered. Chill out with 14 of Melbourne's best cold drip coffees. First up is none other than St Ali with their amazing Iced Cold Latte, served in a bottle. Head Barista Leon Holdsworth is at the helm, making sure this baby is perfect for anyone wanting a cold coffee hit on the run. Made with St Ali’s Orthodox espresso blend, which is 50% Colombian from a co-operative in Pitalito and 50% Brazilian from a farm in South Minas, it’s effing delicious. Combined with organic unrefined Panella sugar, the espresso base is chilled before being added to Demeter certified Bio-dynamic homogenised milk. The result? An amazing creamy texture, similar to a regular latte. Not bad at all! Yep, you read correctly. The coffee genius’ over at Industry Beans have all your bubble cup and coffee cravings covered with their new drink option—picture cold drip coffee, vanilla consoy (blended condensed milk and soy milk) and tapioca pearls soaked in coffee. Hell to the yes. If these little juicy bubbles aren’t for you, they have single origins rotating fortnightly across a range of different brewing methods. Espresso, Pour Over, Gold Mesh, Cold Drip, Cold Brew or AeroPress…pick your poison. For something a bit different (but equally delicious), head to Market Lane Coffee in South Yarra to try their amazing Iced Spritz. Made from a double shot of espresso coffee (around 40ml), poured over a 120ml glass of iced FeverTree tonic water, the Iced Spritz is perfect when you’re after something a little more refreshing. The espresso is a blend of Santa Rita from Brazil, and the Mamani family from Bolivia. Each day Market Lane offers an alternative espresso for customers to try too. Expect a wonderful balance of sweetness, acidity and quinine kick! 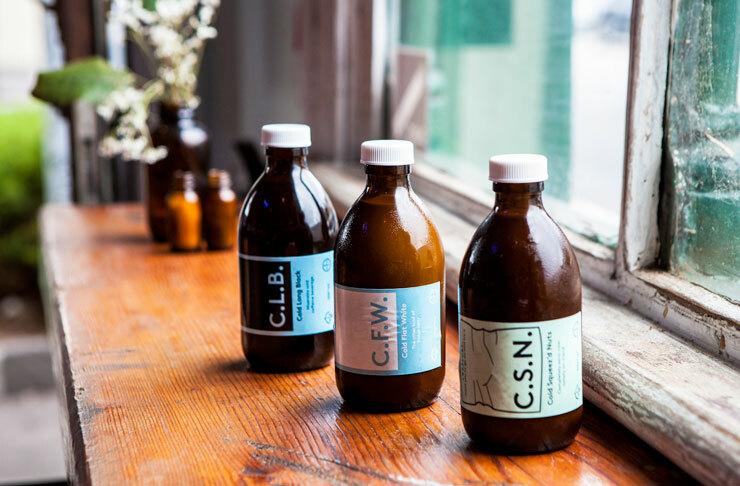 At Little Big Sugar Salt in Abbotsford, you’ll find three delicious bottled cold drip brews—Cold Long Black, Cold Squeezed Nuts and Cold Flat White. Judging by their names, you’d think these guys are made with espresso, right? Wrong. For the Cold Long Black it’s all about steeping single origin coffee overnight in cold water, then filtering it twice before it’s bottled. For the Cold Flat White and Cold Squeezed Nuts, a blend called South from Coffee Supreme is used. It’s steeped in a similar fashion to the Cold Long Black, but at a much higher concentrate, then mixed with St David’s Dairy full cream milk with a touch of yummy maple syrup. You’ll find a few different cold coffees at Dead Man Espresso. First up is the iced latte, which is made using the Dead Man house blend. It has just the right amount of body and acidity to cut through the milk, leaving a simple and creamy flavour that can be enjoyed whenever your boss turns their back. These guys also do a batch cold brew that’s dished up in either a glass or takeaway bottle. Take a sip and you’ll discover a deep, syrupy almost honey-like sweetness, which creates a really addictive flavour. 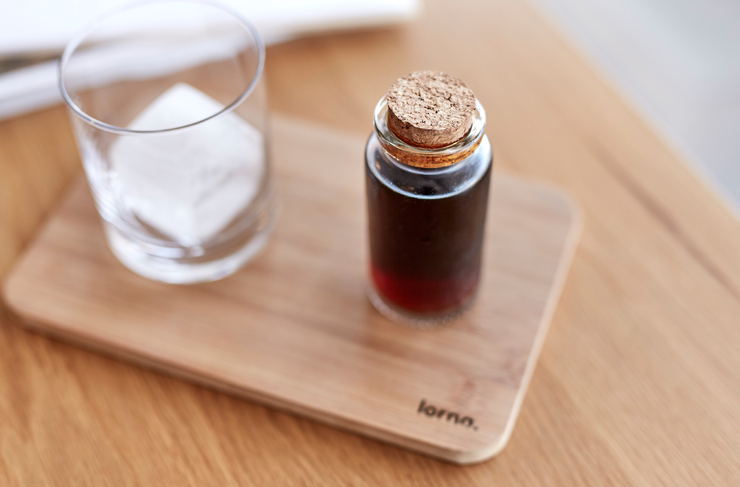 The team at one of Melbourne’s best cafes,Touchwood, like to shake things up a bit when it comes to cold drip coffee. They might be the only ones in Melbs doing coconut cold drip! In a nutshell (or perhaps a coconut shell) this little doozy features freshly ground coffee infused with organic coconut juice. The whole process takes around 12 hours, but the result is a slightly sweeter and less acidic cup that’s pretty darn impressive. Give it a crack. At specialty coffee house Aunty Peg's, the coffee is roasted in-house in Collingwood, then sent down to Geelong to be brewed for between 40 and 55 hours with cold water. It’s then filtered, charged with Nitrogen and kegged all ready to be served on tap in-house at Aunty Peg's. With the added ingredient of Nitrogen, this heavenly drip pours like a thick stout with a white, creamy head. Head on over now and get the Argon\nitro charged cold brew, feat. a delicious blend of Brazilian and Rwandan beans. Sound good? Yeah it does. The newly established gem of Ferntree Gully, Lorna Café, has our heart pounding with their ever-changing single origin cold brew coffees. Their Columbia pour has sweet, tropical fruit tasting notes with a hint of caramel and leaves you with a silky mouthfeel. Just down the road from the 1000 Steps Kokoda Memorial Walk, it’s the perfect way to re-energise those aching limbs. Cafés in Brighton truly brighten up our lives, don’t they? Producing not only amazing food but equally good coffee is The Tamper Trap, Bay St's newest brunch bar. Whether it's their rotating single origins, Rwandan Cold Drip or their house blends: they tick all the boxes. Make sure to pair with a serve of their insane Honey Hotcakes. London meets Melbourne in this Tube-themed cafe smack bang in the middle of Northcote. Your typical, boring flat white got you rolling your eyes? With rotating coffee blends at STN Northcote, you’ll never get bored of your caffeine fix. We hope for your sake that you get to experience their Vietnamese Cold Drip—it comes with a thick layer of condensed milk on the bottom, which you can stir through to get your desired consistency. And PS: they do top-ups. The Abbotsford Club is to regular coffee what James Bond’s martinis are to Goon Bags. It’s an out-of-the-way suburban coffee klatch, the consumer face of local roastery Coffee Supreme, hidden in the industrial backstreets of Abbotsford. Not the sort of place you just stumble across. The first clue is the aroma of the beans, wafting onto Grosvenor St. We literally don't have time to rattle off the thousands of coffee options at this place, but head in on a hot day and try their cold pour with a Coffee Soda Syrup. Ice in the glass, big ol' cube, then a healthy lug of Colombian coffee mixed with Six Barrel Soda. Out of control. Love the caffeinated stuff? 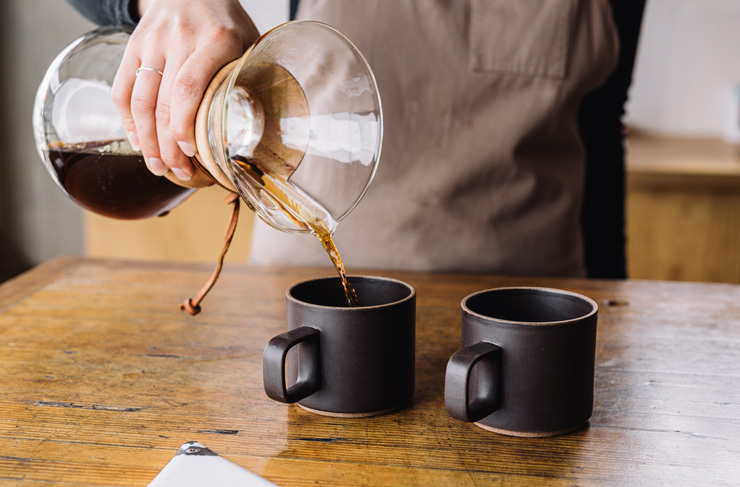 Check out our roundup of Melbourne’s best coffee!